Dan Duquette was fired by Red Sox ownership 10 years ago, but he has returned in Baltimore and may be overseeing the first winning season there since 1997. He had been out of the game for almost 10 years, and Dan Duquette didn’t know whether he’d ever get back in. He took over a team that hasn’t finished over .500 since 1997 in a city that was once baseball-mad and had become mad at baseball. They went from Cal Ripken’s consecutive-game record to consecutive years of being completely irrelevant in the American League East, while playing in one of the most beautiful ballparks in America. And now look at them. The Orioles could be a playoff team. They could even contend with the Yankees for the AL East title. “We’re competing,” deadpanned Duquette, who was hired as executive vice president of baseball operations last November. “We have our challenges, but we go to the coal mine every day and we work hard and we root for one another, and I think there’s a real sense of team with our group. Duquette got the job after others turned it down. He was grateful for the chance. He spent most of the early months trying to get to know the organization, what it had in terms of resources and talent and what it didn’t have. He had to get to know the rest of the league again, too. 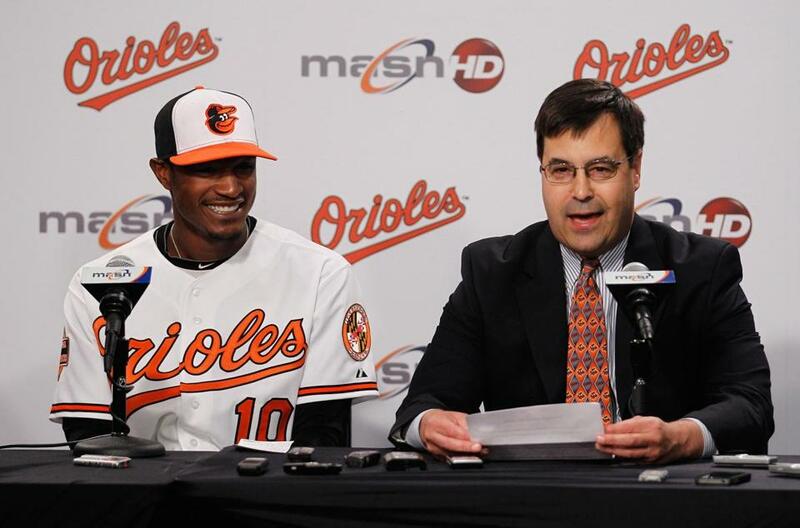 He had to get to know Showalter — a tough, powerful guy who does things his way. Duquette, who was always an authoritative figure in Boston, slipped into the job mindful of that. “I think it’s been great,” said Duquette. “It’s one of the reasons the job was so attractive to me, because Buck and I share the same vision on how to build a strong organization, and I think it’s worked very well. Duquette brought in people with whom he was familiar from yesteryear: Lee Thomas, Gary Rajsich, Fred Ferreira, Ray Poitevint, Danny Haas — people that some may not have considered hiring in this new-wave age of baseball. But they are advisers and consultants Duquette trusts. Like riding a bike? Well, not quite. Duquette probably has taken a few spills along the way, but as we get deeper into August, the Orioles have not faded as many of us predicted. They remain viable even as Duquette has folded 20-year-old Manny Machado, a No. 1 draft pick two years ago, into the lineup as the starting third baseman. He has had to tweak the pitching staff constantly, with injuries and with younger pitchers trying to get over the hump. “We had three-fifths of our rotation in the minors at one point,” Duquette said. “[Jake] Arrieta, [Brian] Matusz, and [Tommy] Hunter. We were able to develop Chris Tillman. We got a shot in the arm with Miguel Gonzalez. Steve Johnson gave us a good start the other night and Hunter is pitching well for us. [Wei-Yin] Chen has been so consistent and [Jason] Hammel was excellent before his knee surgery. Attendance has increased by around 300,000. Baseball is interesting again in Baltimore. He admits that he watches the scoreboard every day. In terms of trying to beat the Yankees and win the AL East crown? Right now, the Orioles are more than holding their own. When you compare their level of overall talent to other teams in the AL East, it’s still not quite there, but their chemistry is as good as if not better than anyone else in the division. Something seems to have clicked, whether it’s Showalter’s magic touch with the players, or the players embracing the role of underdogs. One thing is for sure: Duquette has made a successful return to the major leagues 10 years later. As the guy who runs the organization, the timing couldn’t have been better. Guess there’s something to the power of Evan Longoria. When he left the Tampa Bay lineup after partially tearing his left hamstring April 30, the Rays were 15-8 and were scoring 4.61 runs per game. In his absence, they went 41-44 and averaged 3.86 runs per game. Now that he has returned, the Rays are on a roll again. They were 4-0 in his first four games, averaging 6.5 runs. It’s obviously not all Longoria. The Rays, predictably, have pitched better than anyone else in the division. In their first 25 games since the All-Star break, they led the majors with a 2.22 overall ERA, a .194 opponents average, 250 strikeouts, and a 1.40 bullpen ERA. In nine of their last 16 games through Friday, they allowed one run or no runs. James Shields, who was trade bait at the deadline, has turned it around. And young lefty Matt Moore, who struggled with a 1-5 record and 4.75 ERA in his first 10 starts, is 8-2 in his last 12 starts with a 2.93 ERA, and even more impressive in his last three: 3-0, 0.51, 18 strikeouts, 1 earned run in 17⅔ innings. The bullpen also has been exceptional. Lefty J.P. Howell is working on a 22-inning scoreless streak, and closer Fernando Rodney, who leads the majors with 34 saves (19 consecutive), had 22 scoreless innings before allowing a solo homer in the ninth last Wednesday. Has it been perfect? Hardly. And this says it all: Three players who hit cleanup for the Rays this season — Drew Sutton, Hideki Matsui, and Brooks Conrad — have been designated for assignment. 1. National League Cy Young voters may have to consider two relievers — Atlanta’s Craig Kimbrel and Cincinnati’s Aroldis Chapman. Chapman has been incredibly dominating with his 100 m.p.h. fastball and 103 strikeouts. He has struck out 16.85 batters per nine innings, while Kimbrel is at 15.64. Kimbrel has a slightly better ERA, at 1.29 to Chapman’s 1.31. Kimbrel is also 31 for 33 in saves while Chapman is 26 for 30. 2. OK, we know it’s nearly impossible to win the Triple Crown, but why not Detroit’s Miguel Cabrera? There were those who thought his offense might suffer because of the stress of playing third base, but it hasn’t bothered him in the least. While he doesn’t have the best range, he hasn’t killed the Tigers on defense. As our Bill Chuck points out, too, since 2004, Cabrera has played in 1,375 games (out of a possible 1,407), which is exceeded only by Ichiro Suzuki’s 1,386. 3. Detroit Free Press baseball columnist John Lowe always comes up with historical gems. Lowe noted the fact that Chipper Jones, in his final season, was hitting .320 last week, and looked up the most recent player to have at least 350 plate appearances in his final season and hit at least .320. He found it to be Ty Cobb. That was in 1928, when Cobb hit .323 for the Philadelphia A’s, his 23d straight .300 season. The last player to hit .300 in his final season with at least 350 plate appearances was Milwaukee’s Dave Nilsson. In 1999, Nilsson had 404 plate appearances and hit .309. 4. Baseball America naming Boston’s Ryan Lavarnway the International League’s top defensive catcher is a big deal. That was the consensus of IL managers. Pretty good endorsement. 5. The debate is: If you were starting a baseball team, whom would you build it around? Here are the names that have popped up: Mike Trout, Bryce Harper, Miguel Cabrera, Felix Hernandez, Matt Kemp, Justin Verlander, Stephen Strasburg. 6. Colorado GM Dan O’Dowd doesn’t think the Rockies are far from turning things around. And if anyone can do it, O’Dowd and his staff can. 7. How can you not feel bad for Jason Bay? His career is almost nonexistent because of postconcussion syndrome. He is hitting .152 and has become a platoon player for the Mets. His future is very much in doubt. Bay was having such a significant career until then. 8. Biggest non-story of the year: John Lackey having two beers after a Red Sox loss on the road. If you knew the team rule, it wouldn’t be a story. No alcohol in the Fenway clubhouse and no alcohol on return charters to Boston. Been that way since spring training. 9. Still believe the Red Sox need a strong pitching coach like Rick Peterson, who is currently the Orioles’ minor league pitching coordinator. 2. Wandy Rodriguez, LHP, Pirates — It’s never a good feeling when you give up prospects for a guy to help you at the trade deadline and the guy turns out awful. Exhibit A is Wandy Rodriguez. His first three starts with the Pirates were a disaster. He is 0-2 with a 4.74 ERA as a Pirate. In 19 innings, he has allowed 10 runs and 20 hits while walking 7 and striking out 11. 3. Jackie Bradley Jr., CF, Portland (Double A) — Despite some excitement surrounding Bradley, the Sox don’t expect him to come up to Boston by September. His time hasn’t quite come yet, but he could very well be a Will Middlebrooks-type eye-opener in spring training next season. 4. Manny Acta, manager, Indians — All signs point to Acta being safe in his job and not getting the blame for the demise of the Indians in a season that started with promise. The Indians fired pitching coach Scott Radinsky and designated a few players (including Derek Lowe and Johnny Damon) for assignment. Last week, when we mentioned possible landing spots for Terry Francona, we didn’t mention Cleveland because we don’t think Acta has to worry. But Cleveland is one of the organizations Francona has worked for, and he is highly thought of there. 5. Derek Lowe, RHP, Yankees — Lowe feels he corrected some of his mechanical issues in Fort Myers. He always seems to pitch better after seeing his personal trainer guru, Chris Correnti. “I feel like I’m in football,’’ said Lowe. “I’ve had two-a-days with Chris. It’s been good. I think I can help a team.” The Yankees should get a much better version of the guy who was designated for assignment by the Indians. Lowe will work out of the bullpen for New York. 6. Michael Bourn, CF, Braves — The Braves aren’t holding out much hope that they can re-sign Bourn when he becomes a free agent. They don’t seem to do well with Scott Boras clients, which also seems to rule out any bid for Jacoby Ellsbury this offseason. The Braves will have to replace both Bourn and Chipper Jones, and one Atlanta official didn’t rule out Kevin Youkilis if the White Sox don’t pick up his $13 million option — but the Braves wouldn’t spend anywhere close to that. 7. Ned Colletti, GM, Dodgers — He has done a terrific job and was extremely aggressive in his trade deadline moves. There would seem to be no reason to make a change, even with a new ownership group, but in any situation where there’s a change at the top, there’s always speculation that the new guy (in this case, president Stan Kasten) would want to bring in his own people. 8. Joe Saunders, LHP, Diamondbacks — Saunders would be an interesting trade piece if the D-Backs feel they can’t make the playoffs. He has eight quality starts in his last nine and is currently 6-8 (with four blown saves by the bullpen) with a 3.52 ERA. He’ll be a free agent, but they don’t expect to re-sign him. Arizona has good starting depth, with Patrick Corbin, Tyler Skaggs, and Trevor Bauer on the verge of being viable replacements. 9. Johnny Damon, OF/DH, free agent — He could be a fit for the Braves, who are looking for a lefthanded pinch hitter. He didn’t play well with Cleveland, but his clubhouse presence could be good for a team in contention. The Braves are looking all around for a part-time lefthanded bat and are scouting just about every team out of contention. From the Bill Chuck files: “The last player 25 or younger who hit at least .370 prior to the 25-year-old Andrew McCutchen this season was Ted Williams, who at the age of 22 in 1941 hit .406.” Also, “In 2011, the MLB team average was 102 errors, and the Yankees had 102. Thus far this season, the average is 68, and the Yankees have 52.” . . . Happy birthday to Matt Clement (38) and Reggie Harris (44).